Can a “big idea” be a bad idea? Author James L. Cambias (who has been one of my favorite writers since we were both at the University of Chicago together) grapples with this problem, and how confronting this issue made his new novel Arkad’s World all the better. Sometimes Big Ideas can be dangerous. 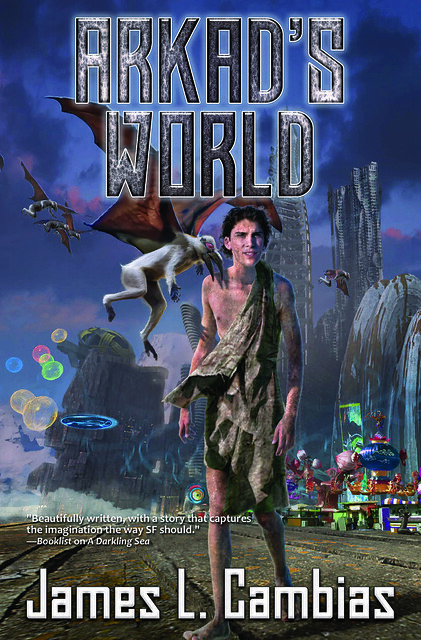 * My new novel Arkad’s World was almost killed by a Big Idea. The book is (in part) a love letter to boys’ adventure stories. As a tip of the hat to one of the greatest adventure stories, Robert Louis Stevenson’s Treasure Island, I wanted to include an ambiguous villain — a Long John Silver type character, who would seemingly befriend my young hero Arkad, while pursuing a selfish hidden agenda. My incredibly clever Big Idea would be that this slippery character would never actually say anything true. His statements would all be sarcastic, or jokes, or rhetorical questions; and when he actually seemed to be speaking in a straightforward manner he was lying. This pathologically untruthful villain would get hold of Arkad, and the two of them would search for a lost spaceship containing Earth’s lost cultural and historical treasures. Meanwhile, a seemingly menacing rival team (who are of course actually the good guys) pursue them and ultimately Arkad realizes he has been duped. Sounds good, right? Very clever, right? Okay, here’s the problem. My young hero is naive. He knows a lot about the world he lives on, but almost nothing about what’s going on elsewhere in the Galaxy. He doesn’t know how important the lost spaceship is. He doesn’t know the political background. And the only character who can tell him all that important information is lying all the time. Which meant the reader can’t find out any of this stuff either. For about six months in 2015 I bashed my head against this project, until I finally realized that my clever Big Idea was actually a really bad Big Idea. It was so clever that it crossed the line into Stupid. I had to scrap most of what I had written, redo my outline, eliminate my unreliable character, and start over. The delay meant that I didn’t finish the manuscript until the end of January, 2016. I was about a week away from submitting it when I got the news that David Hartwell had died. David was my editor at Tor. He “discovered” me and published my first two novels. He gave me encouragement and wise advice. I wanted him to see this book — not just because I wanted to sell it to him, but because I wanted his opinion of it. I wanted to impress him. But because of my stupid clever Big Idea, he never saw Arkad’s World. I felt really bad about that. His death also meant an emergency reorganization at Tor Books. Without David as an advocate, Arkad’s World kind of fell through the cracks, and the company declined to publish it. In the end, it was someone else’s Big Idea — an absolutely crazy-sounding Big Idea — which finally got Arkad’s World published. In the Fall of 2017, at Gregory Benford’s urging, I went to the Tennessee Valley Interstellar Workshop in Huntsville, Alabama. (You can read my account of it here.) The TVIW is a conference dedicated to actually building and launching an interstellar probe to Proxima Centauri by 2060. It sounds mad, but right now I wouldn’t actually bet real money that it won’t happen. The people involved in the project are very smart and very dedicated, and at least a couple of them are very wealthy. On the third day of the conference I played hooky along with some other science fiction writers — including Allen Steele, Sarah Hoyt, and Toni Weisskopf, the publisher at Baen Books. We went on a tour of the Marshall Space Flight Center, including a visit to the old Saturn rocket engine test stand from the Apollo program. Ms. Weisskopf and I were both disinclined to climb the rickety-looking stairs all the way to the top, so we had a little time to chat while the others made the ascent. I told her about Arkad’s World, and she asked to see it. Pitching a science fiction novel to an editor when you’re halfway up a rocket test stand is pretty damned cool. I think the Rule of Coolness forced Ms. Weisskopf to buy the book. Which she did. And now it’s out, so everyone can see the Big Ideas I didn’t have to throw out. *See the history of the 20th Century for examples. Read an excerpt. Visit the author’s site. The Death of the Author! Maybe! I think this would be fine if it were the START of the story. It could be the thing that gets the protag started on his real journey. For ex, (spoiler alert) Neo discovers he is in the matrix and everything was a lie. And his arc starts from there to become the one. Having the truth be revealed later gets tricky, but can still be done. “Wanted” starring Angelina Jolie and James McAvoy does this. (Spoilers) The movie starts out with Morgan Freeman telling James that a man named cross is trying to kill him. Two-thirds in, we all find out cross is actually his father and Freeman is the bad guy. The only way to reveal such a complete lie any later than that and have it work well is to have it be a side piece to the main plot. Sixth Sense, for example, the main plot is the kid coming to terms with being able to see ghosts. At the end (spoiler), we find out that Willis was a ghost who didnt know he was a ghost, and he completes his side-plot by going into the light. The whole (spoiler) “luke i am your father” thing happened in the sequel, which meant it was hidden for all of episode 4, but ep 4 worked with or without that information. And finding out vader was lukes father works because ep 5 was clearly the second act of the three act play of Lukes development. If you hide the info until the very end, and give the reader zero hints about it, then you get nonsense like “The Village” where (spoiler) we find out the village seemingly set in the 1600’s is actually in modern america. And, yeah, thats just bad writing. Your pitch on the rocket test stand worked again; just bought it! Sold! I read the 4 chapter excerpt and was duly entertained. I love boy’s adventures, particularly ‘Treasure Island’. Arkad is a very human protagonist in a world where humans are rare. And the question of his education is very neatly solved.